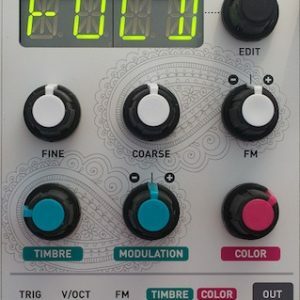 VCAs are the cornerstones of modular patches: shaping the amplitude or timbre of a tone with an envelope, animating a mixture of several oscillators, controlling the amount of filter modulation with a random source or a touch controller, applying an envelope on the linear FM signal hitting an oscillator… are all possible uses of these super versatile building blocks. That’s why you never have enough of them. What about four more? 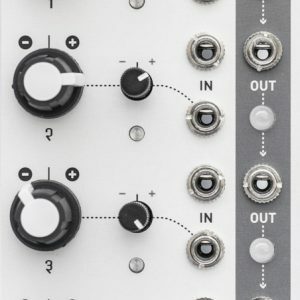 Veils provides four VCAs with an adjustable response curve. Veils’ outputs are daisy-chained, allowing adjacent groups of 2, 3, or all 4 channels, to be mixed together. 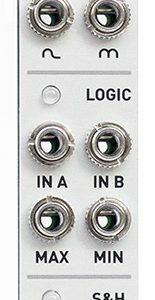 All inputs handle audio-rate signals. Input impedance: 100k for all inputs. 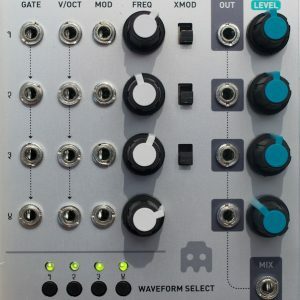 Gain scale: a +5V CV translates to a gain of 1 (0dB). Gain range: 2 (+6dB) in linear operation, 10 (+20dB) in exponential operation. Current consumption: +12V: 50mA ; -12V: 50mA.